I like to search Google ‘smart' as I expect most of my (and your) blog readers do as well. When I search Google for a product type, I limit my search to articles posted within the last year. 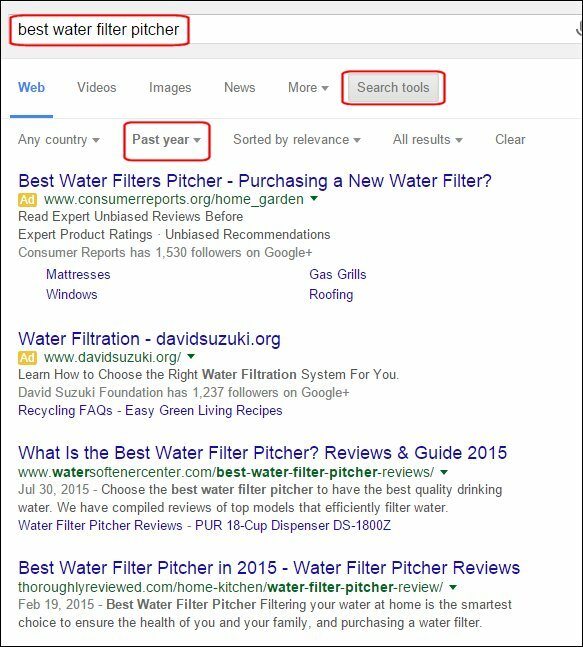 The following graphic shows results for a recent search when I was researching water filter pitcher dispensers for our RV. My search was for ‘best water filter pitcher', but I also selected ‘Search Tools' and then selected ‘Past Year' to avoid reviews that were posted back in 2012. Three years is HUGE when it comes to technological innovations in so many areas, and I hate wasting my time looking at old reviews. Seriously, when I didn't add the time frame element, reviews from 2012 came up in the search results. Note: Your Google Search results could be different depending in which country your are located and which Google engine you are using. So, assuming your preferred audience is likewise savvy when it comes to finding material relevant to your niche, wouldn't it make sense to let Google know when your older articles and reviews have been updated so that those articles come up in those searches? 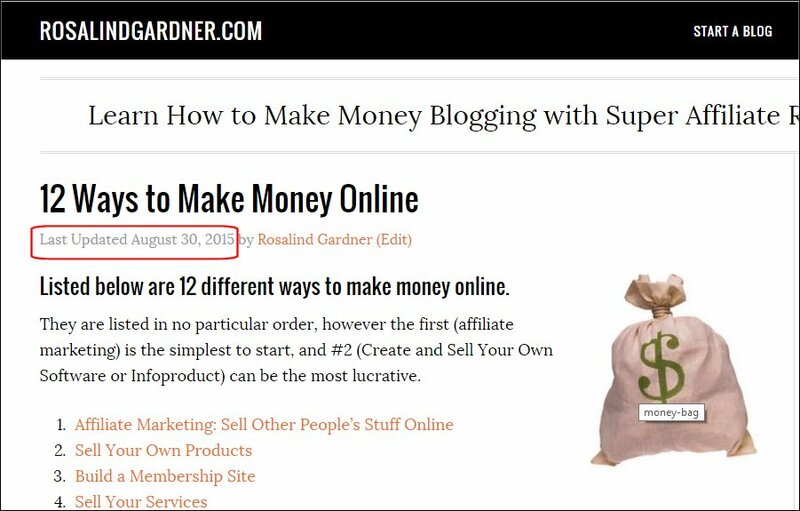 For example, my article 12 Ways to Make Money Online was written and initally published over 6 years ago, on February 2nd, 2009. To insert the last updated post date using Genesis on a WordPress blog is super simple. I went to Genesis > Simple Edits and inserted “Last Updated February 13, 2019 by Rosalind Gardner 16 Comments ” in the blank beside Entry Meta (above content). If you are using another WordPress Theme system, please consult with their support files, OR, visit the WordPress Codex to learn about Function Reference/the modified date. You solved a problem for me! I don’t use Genesis and when I looked at how techie it was to mess around with code in other themes, I wondered if there was a plugin I could use. There are quite a few where you have to put in shortcodes on each post or page, but then I found this article. Only thing I did different was to download the plugin from the link in the article rather than go looking for it among plugins. I don’t even know what Genesis is. Goes to show that there’s always something newer, better, faster, and smarter. You’ve completely made my day, Mary Ann. Thank you! Assume this could also be recommended for websites with consumer information (link removed). Is there a special HTML code that Google would recognize? For the full code, please check out this page..
You always share whatever you learn or experience. This is an amazing tip to stay updated. Thank you Ros, looking for new post with new insights. Thanks Rosalind, that is amazing information! I tested on one blog post. My new date shows up as the modified date, although if I do a google search, it doesn’t show up that way yet. I wonder how long for google search to catch up with the modified date. I don’t know how long mine took, but it wasn’t more than a couple of days, to be sure. I am using Genesis but don’t see any place where there is a simple edits sections.